Last night, many of us learned about Osama Bin Laden’s death on Twitter. And in fact, the first credible report from Keith Urbahn, former Secretary of Defense Donald Rumsfeld’s chief of staff, was also on Twitter. And while the White House kept pushing off the official announcement for an hour to inform different parties, the news was already being analyzed and spread on Twitter . And yet, he was able to break the news before the TV producer who told him could air it on traditional media. Twitter is not in and of itself a news source. Whoever is Tweeting is the source. But all it takes is one person to Tweet out news for it to spread faster than through any other medium. The person doesn’t have to be a journalist. Urbahn scooped everyone. Twitter does not supplant other media, it amplifies it. During the President’s announcement, people were Tweeting at a rate of 4,000 Tweets per second, not an all-time-high, but a close second or third—about the same level of Tweets as during the last Super Bowl. Twitter also drives people to traditional media. Last night, news that the President was going to make a surprise announcement certainly drove people to TV. For instance, I first heard about the news conference on Twitter, and then I turned on CNN. Much of what people were Tweeting was what they were hearing on TV, thus passing the news instantly to people who may not have been in front of a TV at the time. But what that means in practice is that if you are following the right people, you don’t have to actually turn on your TV. You can learn most of the salient facts from watching your Twitter stream. It can be such an efficient way to get information that people mistake it for the source of the news itself. For an increasing number of people, it is becoming the first place they turn to find out what is going on. However, it also points to other media (much like a news search does) and people click on those links to find out more. 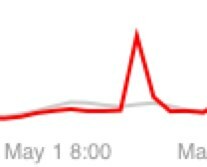 We certainly saw a huge spike from Twitter traffic here on TechCrunch last night, and we are just a technology blog.